(Spring 2011) **Available through special agreement with the original composers** Well, this primary song has sure taken over as the new favorite of a ton of people, has it not?! I am no exception, I love it! I listened with joy to the arrangement sung by the Mormon Tabernacle Choir during April 2011 conference, and shortly thereafter was approached by my bishop, who wondered if we could get a hold of that arrangement to sing in our ward choir for ward conference six weeks later. I told him I would try, and contacted both the arranger and the Choir's secretary to try and get it, but to no avail as they told me there were no publication or distribution plans. I told the bishop and the ward choir director. We stood there in silence for a moment, then we all got a slight grin on our faces...and all said at the same time "So, do you want [me] to write an arrangement?" The bishop laughed and asked for one special request: that we include the melody line for a group of primary children to sing with the choir. That of course got my wheels a-turnin' really fast, and within four days the piece had written itself (as the best ones always do!). I am so pleased and humbled by this work, which gets its strength from the simple testimony of the words. The final chorus where the children and choir all sing together in unison is a truly spiritual moment for me, I hope you feel it too! Many in our ward say they do. 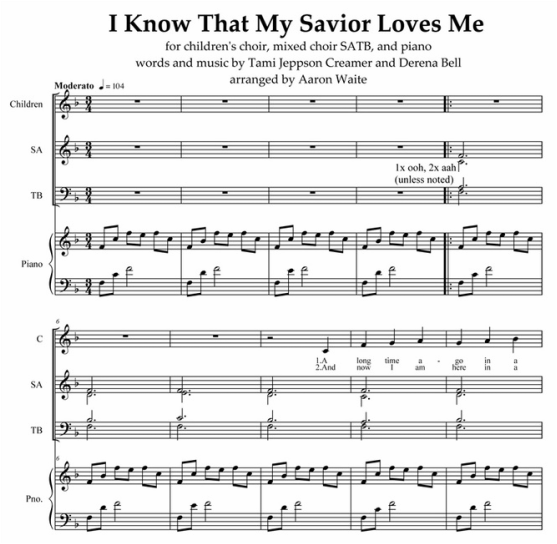 The rest of the story: a member of the ward choir said at rehearsal that they had heard that one of the composers of I Know lived in the city next to us. I went to the phone book and voila! I sent her a letter requesting permission to publish the song on AaronWaite.com and outlining a royalty agreement. Within a week I had a phone call from her and an email from the other composer, both giving me their blessings. AND THEN THEY CAME TO OUR WARD CONFERENCE!